Today is Chinese New Year. I use the time between January 1st and Chinese New Year (Lunar New Year) to get ready for the year to come. Usually this means cleaning and organizing paper work. This year has been a bit different. I have spent more of these last two months home with family than I have in years past. In our family, family-time equates to mealtime. I can’t help but think about how the dynamics of the dinner table are where I learned about community and family. Dinners and now breakfast, lunches, and dinners when we are together are the focal points of the day. My mother, who is 78, tells me that so much of her life was making sure we four kids were fed that even now she has a hard time tempering that muscle memory. As a child around our table, and especially when my parents entertained or we were with my grandmother and others of her generation, there were specific expectations. You sat up straight; did not fall asleep at the table no matter how late the dinner stretched; you answered questions but in no way did you direct the conversation; and you waited for the older generations to be served and for the plate or lazy susan to come to you to fill your plate. As I got older, I shifted into the role of serving the older and younger generations. I was allowed to move plates and turn the lazy-susan. There were moments when I moved the lazy-susan while others were serving themselves as well as awkward silences in the conversation, but I was encouraged to continue to try. As I became more accomplished with the dynamics of the dinner table, I gained more leeway. But with this honor came the responsibility of ensuring that everyone had enough food and drink and taking a larger part in the conversation, often smoothing over those awkward silences. I did not know it at the time, but these meals ingrained a sense of social responsibility in the most practical and elegantly nuanced way. My mind has been returning to the idea of growing into responsibility, but in application to my work. The last few years I have been like a child at the table—unsure, watching and learning, not yet able to insert myself. If I look back over the last few years, I have spoken when I’ve been invited by others to speak. While I am grateful to this recognition and support, I have been wondering if I can speak if I decide to speak. And if could make such a bold move, what would that look like? What would I say? I think that’s why this journal section has been so quiet; with a voice comes responsibility and judgement. But to whom? For what? By whom? All I can do is take the first step. And in my heart-of-hearts, I feel that I need to voice my commitment to make work in service of the community on which my work depends. I have always maintained that my work is more about relationships—with other makers, shepherdesses, farmers, and makers. In the spirit of Aldo Leopold, I would like to subscribe to an expansive definition of community to include soils, waters, plants, and animals, or what he calls “the land” (Leopold: 1949). Our land/community is in crisis. I would like to renew my commitment to working with materials from and in support of people who work in service of this community be it through carbon farming, biodynamic farming, genetic preservation, soil health, etc. These statements are purposely broad because the idea is that the collective community, my responsibility, and the repercussions of my actions are extensive. The beauty is that privilege and responsibility are interconnected, so, yes, there is more responsibility, but I am also anticipating an expansion in conversations, imagination, breadth and depth of skills, and joy. And maybe my tiny footprint can make a difference. This is an expression of choice, intention, power, agency. It also requires commitment over time and a long view of history. There will be course-correction, and I will need to remind myself that there is no expectation of perfection. I’m taking a deep breath and turning on the comments for the first time. I would love to hear your thoughts and suggestions. I value the experience, skills and knowledge of this community. I hope this new year brings everyone joy, love, peace, and a little bit of discomfort to stretch and grow. What if the end goal of time at the dye-pot or on the wheel and loom is not a color, yarn, or a weaving? What if we shift the significance beyond the process? What if we take the 30-year view instead of the 3-week or 3-month view? What if we look at the work we do as makers within the context of doing great work that creates a generous community, a world in which we want to live? What does that look like? Would you rather create art or an artful life? Is it possible to do both? Yes, but I believe it takes an intentional widening of scope and making decisions that might not have any benefit, in fact they might be seen as a setback, for many years or even your lifetime. I wrote this passage after a somewhat strenuous bout on the rowing machine. I shared it with Katie Treggiden when we spoke about the panel. And then I shared it with the panel at the Tate last week. I was invited by Katie, author of Weaving Contemporary Makers on the Loom, to participate on a panel at the Tate Modern to celebrate the launch of the publication. It was an honor to join Karin Carlander, Eleanor Pritchard, and Jen Keane, each a fellow weaver, dreamer, and seeker. And, of course, we were also joined by the spirt of Anni Albers and her wonderful exhibition at the Tate. The evening was filled with shared stories and interesting questions. It was a fantastic opportunity to learn and be among intellectually curious souls that I hope one day deepen into friendships. To think that this evening was the result of taking fiber, turning it into yarn, and making it into cloth. I will never have to wonder why I do what I do anymore. I loved school, and I especially loved my last two years of college and graduate school. Although I studied art history and premedical studies in college, it was only in the last semester of my sophomore year that I found the Classics. Urged by my older brother I took a class on myths in ancient Greek art with a renowned professor. I had never read the myths and could only name a few gods, but I was drawn to my professor’s method of inquiry and demand for academic rigor. I crammed four years of Greek language, classical history, and classical archaeology into the last two years of school. And I was immensely happy. I worked in hospitals in and after college, but I missed art. Through my sister I learned about art conservation—a wonderful confluence of art and science. Having zero talent in painting and drawing, I answered “textiles” when asked where I might want to intern. I I did my first machine and hand-sewing as a conservation intern. And I fell in love both with the world of costumes and textiles and their techniques and history and materials. This year I find myself itching to go back to school. But that seems neither practical nor the right place for me now. The reality is that I am no longer a single entity in pursuit of my latest passion. My time to focus on something is smaller and less frequent than I would like it to be, and my energy is a bit more frenetic and less constant that it once was. I have decided to create my own curriculum for the next year. I am eager to embark on a focused study and practice that results in true expertise. 1. What is delicious is usually also nutritious and good for the land and environment. 2. What the land and farmers have to offer should drive what we consume, not the other way around. 3. Barber’s expertise, namely gastronomy and storytelling, are his tools to bridge the gap between farmers and rest of the population. 4. The true cost of food is expensive, and we have not been paying appropriate prices. 5. Breeders hold a treasure trove of information that is otherwise los,t and they need to be supported and sought out. Each of these points seems to have a direct parallel in the fiber world. 1. It has been my experience that luscious, healthy fiber comes from healthy animals; healthy animals come from knowledgeable and responsible shepherding. 2. I’ve seen too many superfine Corriedale fleeces that really seem to be cormo or merino fleeces masquerading on the backs of Corriedale bodies. Breeds and breed distinctions exist for a reason. Don’t get me wrong, I love crosses, but I find my favorite crosses are bred by shepherdesses that are fluent in the individual breed standards. And each breed has a purpose, just as each part of the fleece is suited to different uses. Working with medium and long wool fleeces last year taught me that every breed has a purpose and that part of being a maker who works with fiber is either to coax out its hidden beauty or to step out of the way and let it shine. 3. 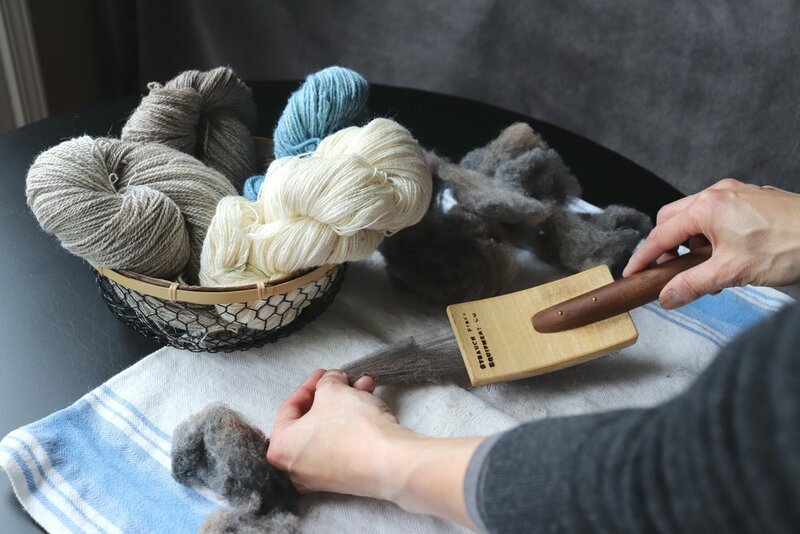 It is our responsibility as makers to learn about fibers, breeds, dyes, techniques, and history. Pardon the pun, but this expertise goes hand-in-hand with honing our skills at the wheel, dyepot, and loom. We need to be knowledgeable so that we can make informed decisions and tell compelling stories because we are the ones who often bridge the farm to consumer gap. We also have the opportunity to increase the circles in which we can champion farms/shepherdesses as well as sustainable practices, both through our words and our work. 4. We need to price our work with respect to the materials and our skills, and we need to support producers of our raw materials. 5. We need to search out those with expertise about breeding and who have been both forwarding thinking and conscious of the long arc of history. They literally hold the genetics and the knowledge that will be key to our futures. What are the specifics of the curriculum? At this point it is a reading list that relates to the various aspects mentioned in the points above as well as a commitment to push my practical skills to another level. I also hope to be able to spend more time with the people who are experts in their fields. There is no better way to learn than to be in the company of someone and watch how they move and work. I’m starting this fall by re-reading Dan Barber’s The Third Plate. The rest of the reading list is just starting to take shape. I will share it here, and I would appreciate any suggestions. Please DM me on Instagram or send me an email. Thank you!! I will also hone my technical skills. I want to feel expertise in my craft for several reasons—to honor the traditions that came before, including my grandmother’s handskills and my mom’s sense of design; to feel the thrill of fluency in my fingertips in each aspect of my work. When I encounter extraordinary fiber, I don’t want to interfere too much. I want to direct my skills to play a supporting role that allows that fiber to sing. But doing that actually requires more study, experience, and practice. I hope you’ll join me here, and I look forward to sharing what develops with you. I’ve written and re-written this journal entry at least 20 times. What is it that Gandhi said? In the last few months I’ve felt the truth of his words. I have also come to understand a corollary…I choose my actions thereby consciously or subconsciously set my priorities. Of all the things on my to-do list, which ones do I do first? Which ones regularly get pushed to the bottom of the list? As much as I need to choose to do the things that make my home and my family stay one smile shy of insanity, I also need to choose to do the things that continue to propel me to be who I want to be and if at all possible, contribute to a world in which I want to inhabit. This has led me back to this space. But before I was here, I was somewhere else. If you’ve followed me on Instagram or visited this website, you know that I spent many years as a textile conservator working with a wide array of museum collections both in the US and the UK. I am so grateful for my education and experiences in this realm. I have studied, handled, researched and written about exquisite textiles from all over the world. I developed my eye, handskills, technical expertise and scientific and historical understanding of textiles. And I honed those more slippery skills—those less tangible skills that allow me to look at a textile and have a visceral reaction that something is a bit off. The more tangible skills provide the information, the facts, that are useful in expressing that visceral reaction and sharing it with others. I’ve seen exquisite costume and textiles made for kings, queens, popes, and other elites of society. They are each breathtaking and intriguing. They are examples of what is possible, even if that level of craftsmanship and design are seemingly unattainable today. But I’ve also seen more humble garments and textiles—those that are too worn to warrant display but whose creases, stains, and mending bear witness of no less a life. Exactly what makes them less eye-catching can be the clues that when linked together form a compelling narrative or object biography. My purpose is not to elevate one textile over another. Rather, I seek the human element in textiles—the people who made them, the people who used them. The history of textiles is inextricably linked to the long arc of humanity. Textiles reach into the crevices of our lives and hold memories in their very fibers—adapting, adjusting, reinventing. In this place, I hope to share stories of these human interactions and object biographies both as a maker and a student of textile history and techniques. Mostly I would like to share what I can with anyone who is open to learn and the learn from anyone who is willing to share. This is where I choose to place my energy. This is my call of action to myself. Well…it’s a start.